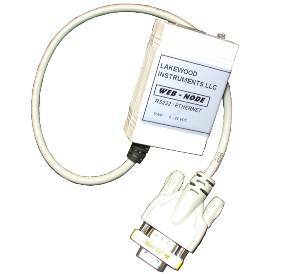 The Lakewood Instruments WebNode connects the 2000 series -RS2L option card to Ethernet networks using the IP protocol family and the Transmission Control Protocol (TCP). The WebNode contains a Web (http) server that allows presentation of custom content. Compatible with ALL existing 2000 series controllers with the RS2L option. Plug and Play, minimal setup for intranet connections. Accessible via Internet through pre-assigned ports (with firewall access). Built in Web server hardware to prevent network port access by un-authorized sources. 99% of standard LRWS functions are available (Requires installation of LRWS and com port re-director software). The unit’s configuration is stored in nonvolatile memory and is retained without power. Only one person at a time may access the controller. This eliminates the possibility of several people simultaneously attempting to configure the 2000 series controller. Simple, easy to access these devices from a local network or a remote location. Self contained web page, not hosted by manufacturer. Web page is accessible by an IP-based application (i.e. a web browser) over an IP network from any place in the world. Removes RS232 cable length limitations by using Ethernet or IP/TCP networks.